It’s October, the leaves are changing color, it’s colder and everyone is raving about pumpkins! Pumpkin this, pumpkin that… pumpkin spice lattes, cookies, rolls, cakes, muffins – you name it: when October hits everything has pumpkin, and I LOVE IT. I especially love these Pumpkin Spice Biscotti. 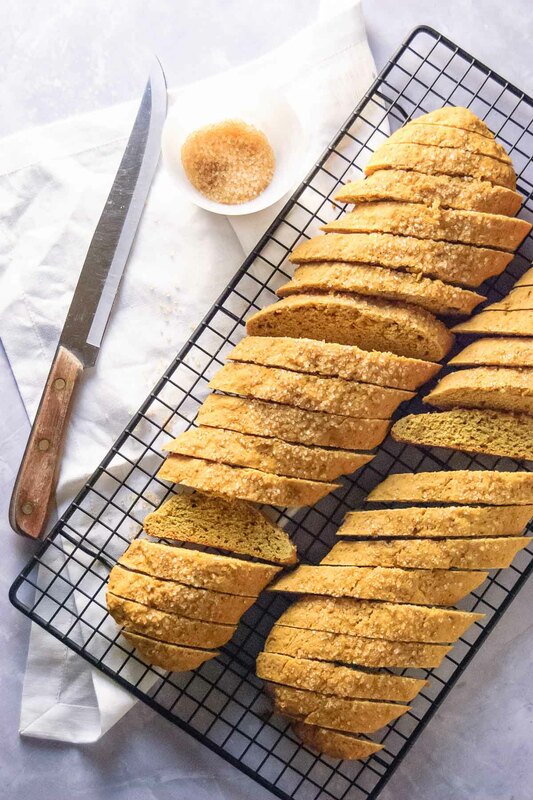 Ever since finding the original recipe for them in a Chatelaine magazine, three batches of these biscotti have been made every Thanksgiving: one batch for at home, and two batches to bring to the cottage – and when I say I’m bringing these up, people do little dances in their seat and debate if they’d be for everyone or kept aside for the hosts. It’s actually pretty funny to see everyone get a joyous smile when they hear the answer to “what’s in the Tupperware container?”. Hopefully, this year will be no different. Now, I have posted about this recipe before, way back when I first started blogging: before using a DSLR, food props, natural lighting, good artificial lighting, photo editing, etc, etc, etc. Looking back at that post, there has been a huge learning curve and I think my work now definitely shows a difference – although I am not completely happy with these photos and had to send edited options out for an opinion. Let’s just say I haven’t quite got the knack of artificial lighting and how to edit those photos, but I’ll get the hang of it. I have no choice. Being at the university full time doing my master’s, cooking and photo taking are relegated to the weekend and at night, and it gets dark really fast (way winter! – not). 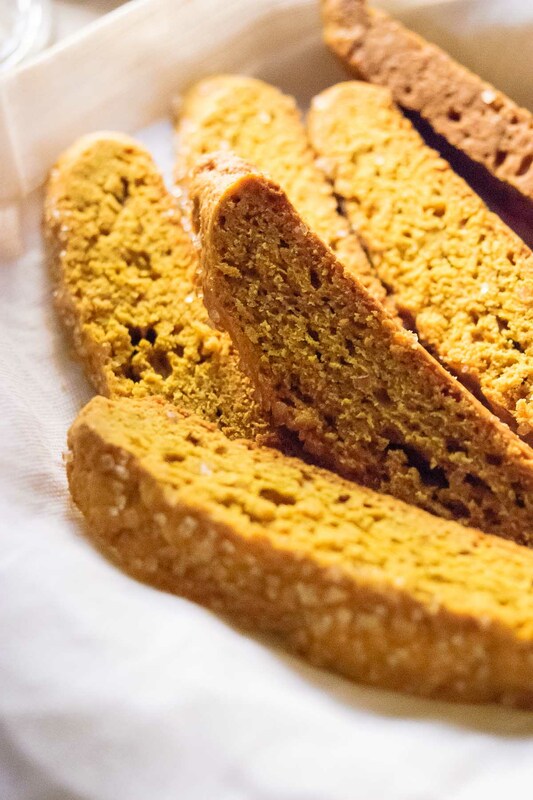 As mentioned in the old post, biscotti are called so because they are cooked/baked twice (bis – twice, cotti – cooked). And although they are cooked twice, they are not hard to make, just long. But don’t freak out over the cook time! I usually cook these yummy cookies over two days. The first day I make the dough and bake the logs, letting them cool overnight to cut and second bake the next day. You don’t have to worry about the logs being put away over the night because exposure to air is good! 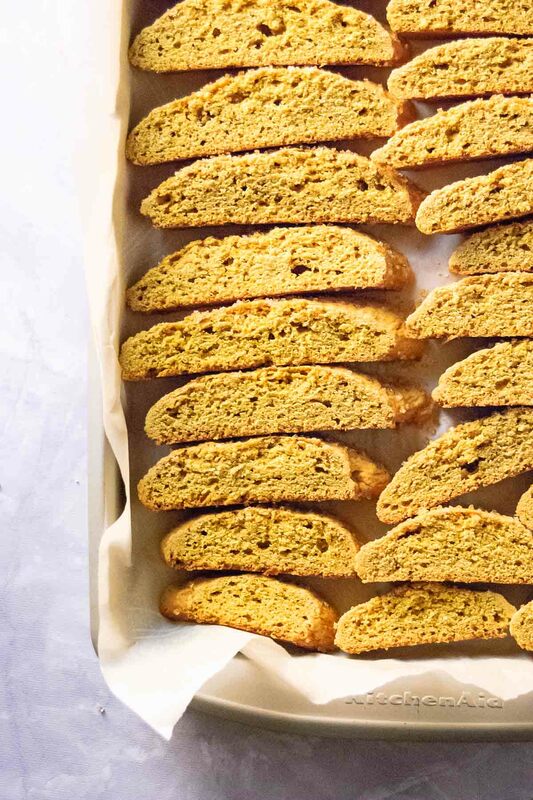 Biscotti are meant to be hard, and that’s what makes them perfect for a dunk in coffee, tea or milk! Plus, I find them much easier to cut when they are completely cooled. So if you’re looking for a great cookie recipe that keeps well and makes everyone happy this time of year, you found it! Also, These cookies look great in a cookie jar given as a host/hostess gift – I know many of you will be visiting family soon, whether it be for Canadian or American Thanksgiving and giving a jar full of cookies that can be filled year after year is a gift that keeps on giving! 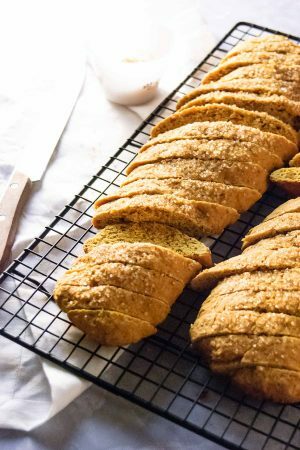 Crisp dunkable cookies, perfect for coffee, tea or a cold glass of milk - this Pumpkin Spice Biscotti recipe is an October and Thanksgiving must! Place rack in the middle of the oven and heat to 350F. Line a baking sheet with parchment paper or a reusable liner. Combine flour, sugar, pumpkin pie spice, baking powder and salt in a large bowl. Set aside. 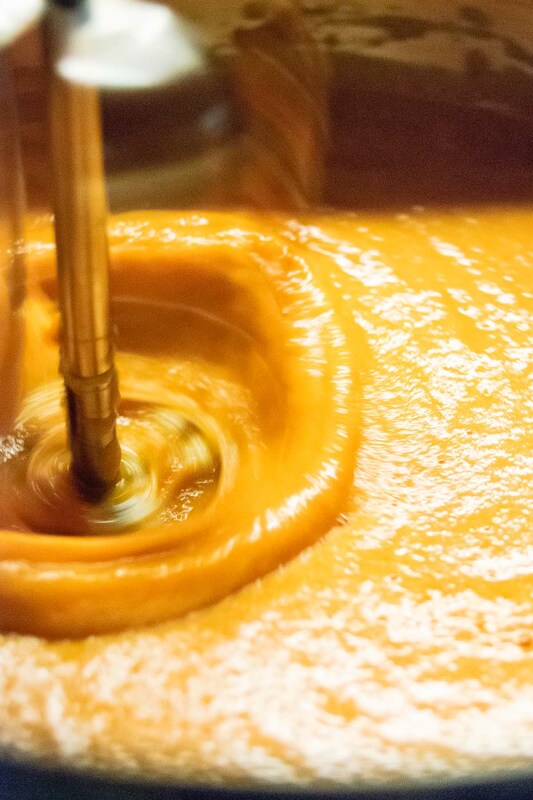 Using an electric mixer or handheld mixer, whisk eggs, pumpkin puree and vanilla together. Whisk the melted butter into the wet ingredients slowly so that the mixture does not get too warm. Pour the liquid mixture into the dry ingredients and stir/knead until a dough forms. Transfer dough to a floured surface to shape into two flat logs that are about 2-inches wide and 1/2-inch tall. Sprinkle coarse sugar on top pressing it slightly into the logs so that it adheres. 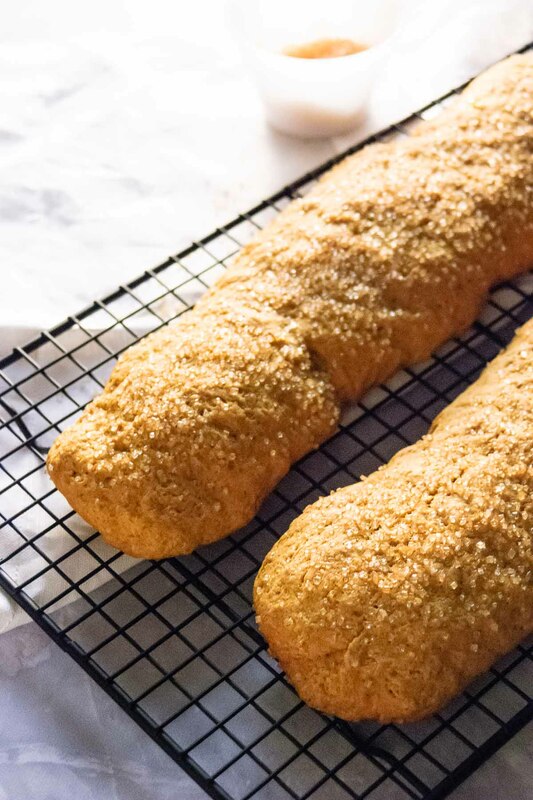 Bake logs until they are firm to the touch, about 50 minutes. Cut logs into 1/2-inch wide slices and place the slices cut side down in a lined baking sheet. Bake for an additional 40 to 50 minutes turning the cookies over halfway through, they should be dry and have no cakey bits. Let cool on a wire rack and store in an airtight container. These cookies are AMAZING dunked into coffee, tea or milk! 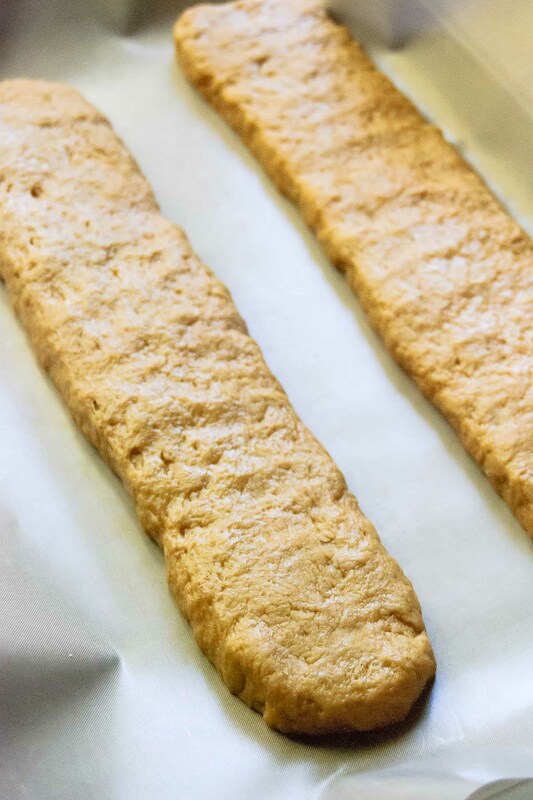 You can make these biscotti over two days, letting the logs cool overnight. The logs are much easier to cut once they have cooled.